The Health Department is recommended people get the Hepatitis A vaccination. I would recommend you discuss the vaccination with your doctor as there may be contraindications. Prior to administration, inform the parent, guardian, or responsible adult of the benefits and risks of the vaccine, and provide the Vaccine Information Statement, accessible at the Centers for Disease Control and Prevention (CDC) website. These actions are required by the National Childhood Vaccine Injury Act of 1986. If a dose of hepatitis A vaccine, inactivated has been previously given, question the parent or guardian about previous adverse reactions that may preclude further administration. Report all adverse reactions to the Vaccine Adverse Event Reporting System (VAERS), as well as the manufacturer. The toll-free number for VAERS is 1—800—822—7967. Educate the responsible adult(s) to promptly report any adverse reaction after vaccine administration to a health care provider. Hepatitis A vaccine, inactivated is contraindicated in patients who have had a severe allergic reaction (e.g., anaphylaxis) temporally associated with a previous dose of this vaccine or hypersensitivity to any of its components. Use of this vaccine is contraindicated in patients with a neomycin hypersensitivity; the vaccines contain a residual amount of neomycin from the manufacturing process. Patients who develop symptoms suggestive of hypersensitivity should not receive further injections of the vaccine. Further, patients with latex hypersensitivity may not be appropriate candidates for the vaccine as the syringe plunger and tip caps of prefilled syringes and the vial stopper of Vaqta contain dry natural latex rubber that may cause allergic reactions; the plunger and tip caps of Havrix may also contain dry natural latex rubber. The vial stopper of Havrix does not contain latex. Epinephrine (1:1000) injection and other agents used in the treatment of severe anaphylaxis should be immediately available in the event of a serious allergic reaction to the vaccine. Patients with thrombocytopenia, vitamin K deficiency, a coagulopathy (e.g., hemophilia), or receiving anticoagulant therapy should be monitored closely when given hepatitis A vaccine, inactivated because bleeding can occur at the IM injection site. The vaccine should be given only if the potential benefits clearly outweigh the risk of administration. If the decision is made to administer the vaccine in such persons, the vaccine should be given with caution. Steps should be taken to avoid the risk of bleeding and hematoma formation following intramuscular administration. The decision to administer or to delay vaccination with the hepatitis A vaccine, inactivated because of current or recent febrile illness depends on the severity of symptoms and on the etiology of the disease. The Advisory Committee on Immunization Practices recommends that vaccinations be delayed during the course of a moderate or severe acute febrile illness and administered after the acute phase of illness has resolved, unless the patient is at immediate risk of hepatitis A infection. Use caution when administering the vaccine to patients with severely compromised cardiopulmonary status. All vaccines can be administered to persons with minor illnesses such as diarrhea, mild upper-respiratory infection with or without low-grade fever, or other low-grade febrile illness. Persons with moderate or severe febrile illness should be vaccinated as soon as they have recovered from the acute phase of the illness. Patients with immunosuppression may respond to hepatitis A vaccine, inactivated with lower antibody titers than non-immunosuppressed patients. Immunosuppressed persons may include patients with human immunodeficiency virus (HIV) infection; severe combined immunodeficiency (SCID); hypogammaglobulinemia; agammaglobulinemia; altered immune states due to generalized neoplastic disease; or an immune system compromised by radiation therapy or drug therapy (e.g., chemotherapy or corticosteroid therapy with greater than physiologic doses). Short-term (< 2 weeks) corticosteroid therapy or intra-articular, bursal, or tendon injections with corticosteroids should not be immunosuppressive. Patients vaccinated with hepatitis A vaccine, inactivated within 2 weeks before starting immunosuppressive therapy or while receiving immunosuppressive therapy should be considered unvaccinated and should be revaccinated at least 3 months after therapy is discontinued if immune competence has been restored. Lower antibody titers are particularly a concern in patients with human immunodeficiency virus (HIV) infection, as the CD4 count at the time of vaccination has been associated with reduced development of anti-HAV IgG antibodies; however, data suggest that patients will respond to vaccination after immunologic reconstitution with highly active antiretroviral therapy. In a study, response to vaccination was directly related to the CD4 cell count at vaccination: the higher the CD4 cell count, the higher the likelihood of detectable anti-HAV IgG. Patients with a CD4 cell count less than 200 cells/mm3 were 16 times more likely to be nonresponders, and a CD4 cell count of 200—500 cells/mm3 was associated with a 2.5 increased risk of non-response. The relationship between the CD4 count and vaccination response was independent of the nadir CD4 cell count and viral load. According to the guidelines for the prevention and treatment of opportunistic infections in HIV-infected adolescents and adults, assess the IgG antibody response to the hepatitis A vaccine, inactivated one month after vaccination, and revaccinate nonresponders. No adequate and well-controlled studies have been conducted with the hepatitis A vaccine, inactivated during pregnancy. In pre- and post-licensure clinical studies and post-approval reports, pregnant women who were administered hepatitis A vaccine, inactivated had rates of miscarriage and major birth defects that were consistent with estimated background rates. According to the Advisory Committee on Immunization Practices (ACIP), administration of inactivated virus vaccines to pregnant women has not resulted in adverse effects in the fetus. The ACIP recommends vaccination during pregnancy when the likelihood of disease exposure is high, potential infection would cause harm to mother or fetus, and when the vaccine is unlikely to cause harm. There is no information regarding the presence of hepatitis A vaccine, inactivated in human milk, its effects on the breast-fed infant, or its effects on milk production. According to the Advisory Committee on Immunization Practices (ACIP), inactivated vaccines pose no risk to breast-feeding mothers or their infants. Consider the developmental and health benefits of breast-feeding along with the mother’s clinical need for hepatitis A vaccine, inactivated and any potential adverse effects on the breast-fed child from hepatitis A vaccine, inactivated or the underlying maternal condition. If a breast-feeding infant experiences an adverse effect related to a maternally administered drug, health care providers are encouraged to report the adverse effect to the FDA. Hepatitis A vaccine, inactivated is only indicated for intramuscular administration; do not give via intravenous administration, subcutaneous administration, or intradermal administration. Incorrect administration may result in inadequate immunity. Patients with chronic hepatic disease may have a lower antibody response to hepatitis A vaccine, inactivated. During immunogenicity studies in adults, subjects with various forms of chronic hepatic disease had lower geometric mean antibody titers 1 month following dose 1 of the vaccine (ranging from 478 milli-international units/ml for chronic hepatitis C patients to 1245 milli-international units/ml in healthy patients). One month after a booster dose given 6 months after dose 1, seroconversion rates were similar among groups. The relationship between these data and the duration of protective immunity is unknown. Ocrelizumab: (Moderate) Administer all non-live vaccines at least 2 weeks before ocrelizumab initiation, whenever possible. Ocrelizumab may interfere with the effectiveness of non-live virus vaccines. Attenuated antibody responses to tetanus toxoid-containing vaccine, pneumococcal polysaccharide and pneumococcal conjugate vaccines, and seasonal influenza vaccine were observed in patients exposed to ocrelizumab at the time of vaccination during an open-label study. Infants born to mothers exposed to ocrelizumab during pregnancy may receive non-live vaccines as indicated before B-cell recovery; however, consider assessing the immune response to the vaccine. 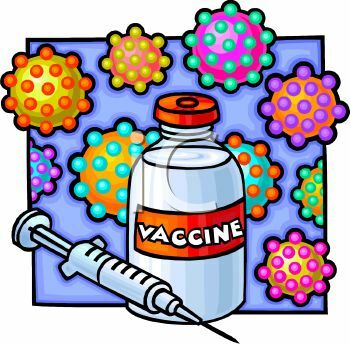 ACIP recommends that patients receiving any vaccination during immunosuppressive therapy or in the 2 weeks prior to starting therapy should be considered unimmunized and should be revaccinated a minimum of 3 months after discontinuation of therapy. Passive immunoprophylaxis with immune globulins may be indicated for immunocompromised persons instead of, or in addition to, vaccination. Siponimod: (Moderate) Administer all non-live vaccines at least 4 weeks before siponimod initiation, whenever possible. Vaccines may be less effective if given during siponimod treatment and for 1 month after discontinuation of siponimod treatment.